I believe in three irreversible truths when it comes to dealing with certain situations. One, if I had to fight my way through an angry mob; I want Marty McSorley on my side. Two, if I ever have to survive a military interrogation; I want Ghandi as my legal representation. And three, if the world freezes over and I decide to drive to Hollywood to try my luck at making it big; I want Alex Debogorski driving me. Yes that Alex Debogorski. You know, the father of 11 kids who drives truck on some of the most perilous of frozen roads, who recently wrote a book, and survived a pulmonary embolism a few years back. 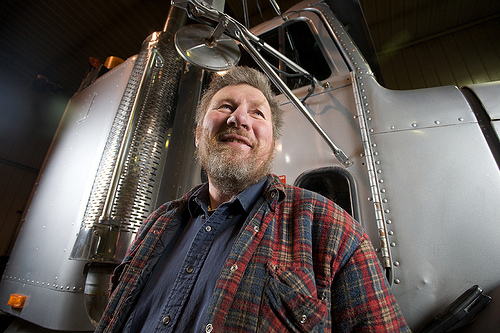 This eclectic Yellowknifer seems to have done a little bit of everything in his life, and it shows true when he is on camera during documentary/reality show Ice Road Truckers. When I got a chance to talk to him, I was a bit surprised. I was expecting a gruff weather-worn individual, who at any moment would start yelling at me about how the world works. But what I got was a gruff, weather-worn individual, who was more like an uncle who told me jokes about how the world works. “I’m a character, I could be in Hollywood,” laughs Debogorski. “I could be one of those guys that would be the lead in a movie and not have to act. I don’t have to be a character because I always am one. Most people try really hard because they want to be different. They get piercings in their nose and tongue, but I let my character shine. I don’t need any tattoos or hair colouring to make me stand out. It’s funny because I was a shy kid, but now I’m pretty gregarious. The show depends on the strength of the characters, and they’ve cast a pretty good collection. We wouldn’t be happy being someone else. We enjoy being ourselves. Others want to be other people whereas we don’t need to be. I’m the funniest guy I know; I even laugh at my own jokes,” says Debogorski. As much as Ice Road Truckers is about the characters involved and their everyday dangers, the collection of all these characters into one ice globe is what people see. What Debogorski sees, is a way to reach out to them and, in just being who he is, teaching them a bit about his world. I wanted to ask him if he ever sleeps but I couldn’t. He was too busy describing all the things he’s working on. I’m pretty sure that he may have to live two lives in order to get it all done. With all the things he’s doing and selling and wanting to do, the thing that stood out most about Debogorski was his humanity. He was utterly honest and forthright throughout the entire conversation. You might not agree with him on certain topics, and you might not really gel with his personality, but he has a candour that is utterly appealing. Like an uncle that you were always fond of but don’t see often, Debogorski has a way of talking to you, not at you. He is, ultimately, real. Lawyer, trucker, poet or wheelchair builder, Debogorski could conceivably be all of them at the same time. One thing is for certain though; I may have to overturn two of my three irreversible truths. If I’m ever in a military interrogation because of some sort of conflict with an angry mob, I may have to call Alex Debogorski in as legal counsel. That is, if he is not too busy. Thanks for the comment and compliment! That sounds very interesting, travelling with Alex. He was great to talk to; a very fun interview indeed. A documentary eh? Who is it for? Alex or the television show?